Sindhis are observing Vadhi Gyars or Ekadashi fast today. A heavy Dodoh (Flatbread) with potato curry could not be a fasting food for me, but it tastes delicious for sure! 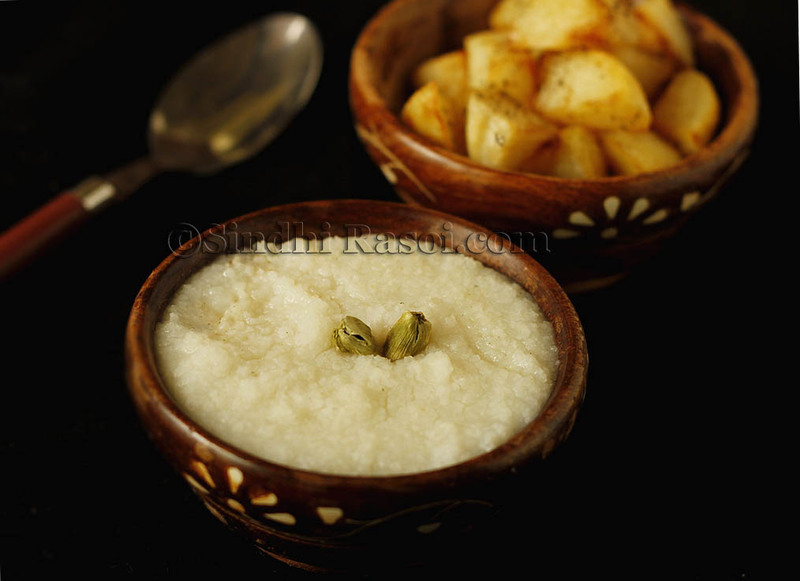 Sindhis observe Vadhi Gyaras or Badi Ekadashi (Prabhodhini) with exuberance, avoiding grains for the whole day. Evenings are generally spend on arrangements for Tulsi ji shaadi (Tulsi Vivah), followed by the rituals of Tulsi marriage and singing prayers and songs and sharing food. At some places even kartik Katha is read. Sauri or Bhagar/Varai flour is made from samo seeds (Mario seeds) i.e the seeds of a grass Echinochloa Colonum, and is eaten on the fasting days when grains are prohibited. Rajgira (amaranth), water chestnut flour (Singhare ka atta) and Buckwheat flour could be also used to make deep fried Puri or fritters (pakora). 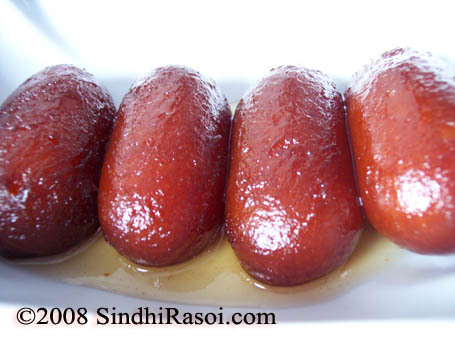 Kharkun (dates), dahi, ratauli/Lahori gajjar (sweet potato), either roasted or boiled and sweetened with sugar syrup is also had along with coconut, sago seeds (sabudana) etc. Kirng patata i.e Samo seeds porridge (savory as well as sweet) served with shallow fried potatoes (flavored with just salt and black pepper powder) is preferred for breakfast and the road side carts are found selling Gyarsi Chaap ( Tawa fried potato patty, made from mashed boiled potatoes, salt, pepper along with arrowroot starch to bind the potatoes) served with potato and lotus stem curry. 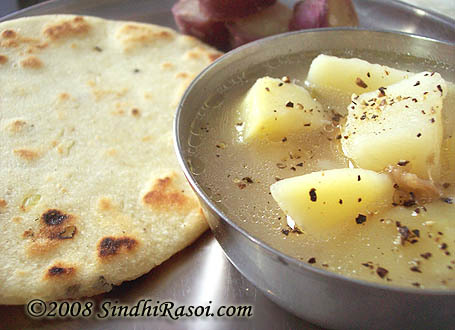 A typical Sindhi ekadashi food is Gyarsi or Ghyarsi dodo bhaji, which consists of potato and lotus stem in watery curry, relished with Dodo/ Dodoh made from Sauri flour. 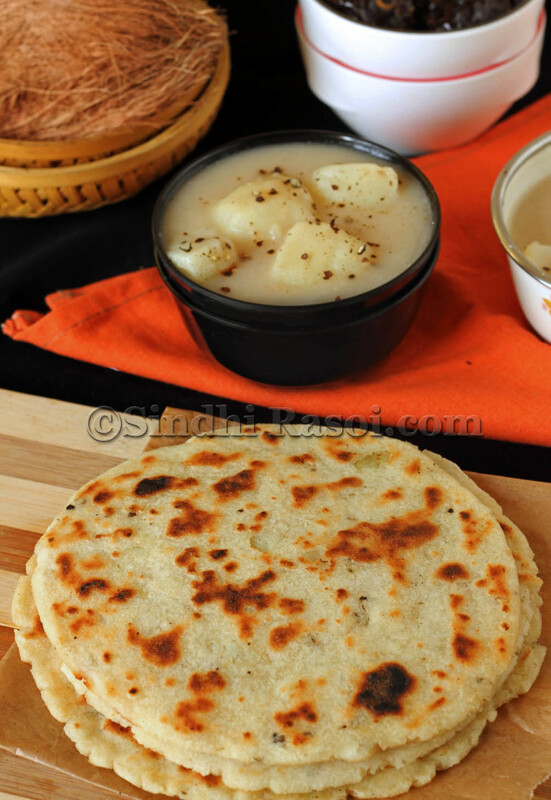 Potato and lotus stem curry with sauri flour flat bread cooked during Ekadashi fast. Now in a pressure cooker add 2 tsp oil, and mix a tbsp of Sauri flour and roast it till slight change in colour is observed. Add water (mix well to avoid lumps), salt, black pepper powder and potato cubes (You can add boiled kamalkakdi too) tamarind water, green chillies and mix properly. Close the lid of cooker and wait for 2 whistles. Take a cupful of sauri flour , and mix salt, pepper, mashed potato and little oil. Add a little amount of water and make soft dough. Divide it into two. Pour a little of oil and let the dodo cook on medium flame till small brown patches appear. Toss and cook on other side too. Repeat for remaining dough. The dough tends to get loose and difficult to handle with time. Hence make sure to cook the flatbread as soon as you knead the dough. even we are proud to be sindhi. Bagar its also called as Varai… Maratha’s make varai cha Bhaath (mean rice).. a simple as we cook rice. 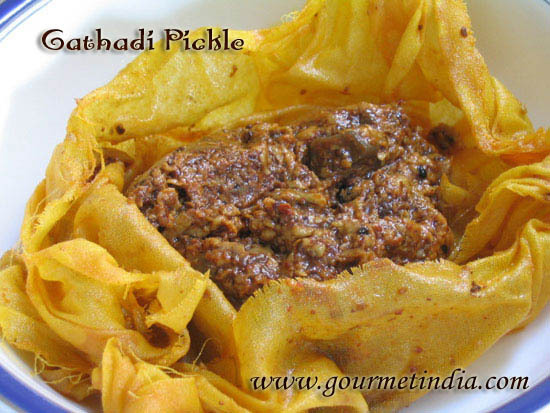 I also add this in making sabudana vada’s, its said that it reduces the oil absorption while making the vadas. It tastes better if we use boiled potatoes. In third step – I add boiled potatoes, salt and black pepper. I “bhuno” it for 2-3 mins. then I add water. When water comes to boil, I add tamarind paste. Sauri, I guess is also called as “samo ke chawal”. It’s khichdi is really too good. And the flour, as is mentioned in your receipe, is for making rotis. Its very g8. But in ekadashi we cant eat green chilli as mentioned in ekadashi katha… Pic is very nice…. 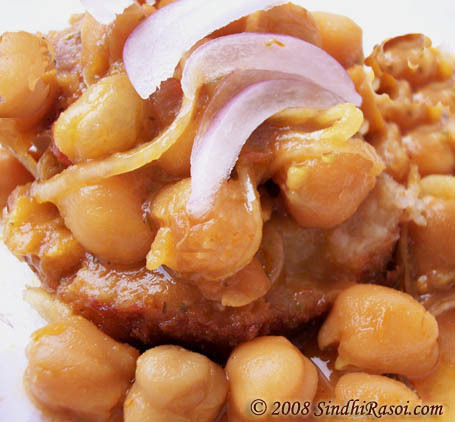 picture looks very good, i am tempting to do this receipe immediately, but the flour is little bit confusion, is it available in indian grocery stores or american grocery stores? hai ,please let me know the sauri flour because this is the first time i heard this. iam in banglore. where i will get this and any name in english or kannada? very nice recipe. I have already updated the post with the info..anyways Sauri is called little millet in English ! 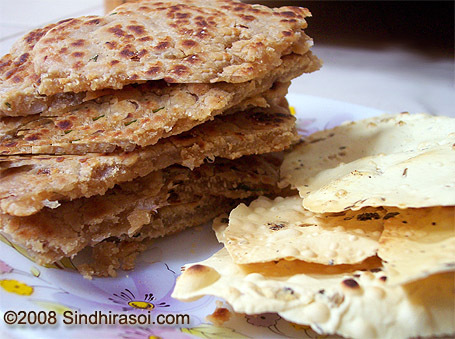 The only maani missing from the Sindhi flat bread ensamble is the bajhri ji maani. Do add that also please. Sorry for the late reply!!!! !I would have missed this entry…thank god i did not! awesome recipe ! if i had to have this for a fast….i would fast everyday my dear! thanks for ur lovely comments yaar…. I tried to explain the ‘phenomenon’ of fasting foods to my firang wife and she almost fell down laughing. I have yet to convince her that it is still a fast even if we are allowed to eat. As ridiculous as it may sound. looks lovely the pic .. what is sauri flour? wow, a delicious, tempting gravy! Gorgeous picture too! Hi,Thank u so much for ur comments…. Alka gravy is looking very tempting. I like to have such kind of curry sometime.s yummy looks. Looks delicious, Loved the pic. I do not know most of the ingredients mentioned….I have learnt a few of them now. I am amazed about the various cuisines of India and ashamed about not knowing much about them. Interesting recipes for ekadasi. In south, we avoid rice for ekadasi fasting and wheat takes its place. All these flours are readily available in big malls just before big ekadashi. 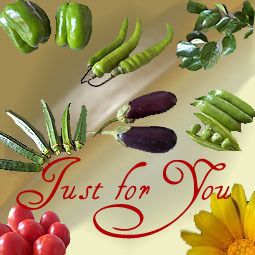 Rajgiri,sabudana,singhada flours, etc. Buy them all and use them even after ekadashi. Varai /varai flour is widely used by all during ekadashi. It resembles rice, but is used for fasting recipes and is not rice.